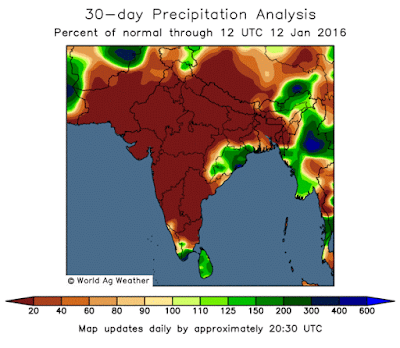 Bhopal had 21 mms of rain in the day on Monday..Along with rains in many places, Cold day in most M.P. on Monday 18th, with Satna seeing a high of 17.3c, Jabalpur & Gwalior 20.0c, and Khajuraho 18.6c. Rains and Hail expected on 19th in M.P, Chattisgarh, Jharkhand, East Vidharbh, Telengana (Hyderabad) and Interior Karnataka (Bangalore). Gurgaon (NCR) saw a low of 3.2c and Meerut 2.8c. Thursday 14th: Day Temperatures dip in Punjab....Ludhiana saw a high of 12.4c, Patiala and Ambala 15c and Amritsar was 15.7c as the maximum. Delhi centres recorded 19c in the day. The first day in the season to fall below 20c ! In the Mountains, Srinagar was at 7.6c in the day, Simla saw a high of 9.9c on Thursday. In the East, Cherrapunji was at 16.2c as the high at low was 5c..(no rains). Pakistan: Muree saw a high of 8.5c, Lahore was 15.5c, while Islamabad was at 18.0c. This comes as a relief to Northern India. Most of the Northern regions have been experiencing warm weather. After Christmas, the peak winter period, the days started getting warmer....the temperatures are above normal from 2c to 7c. In Kumaon, which is getting unusually warm temperatures, the fruit trees have started flowering, almost 45 days in advance. 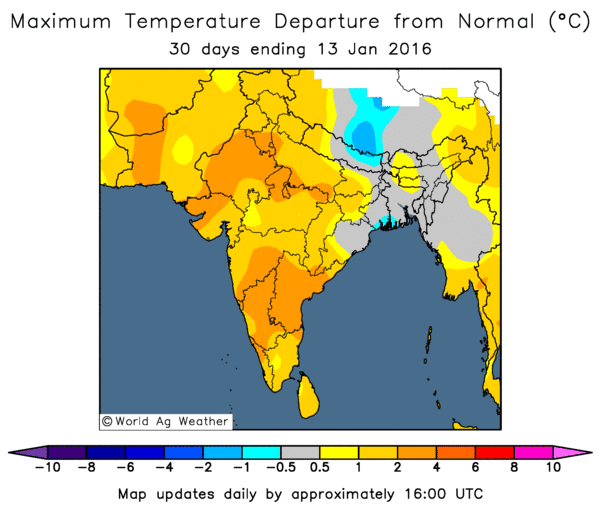 Day temp Anomaly from 13th Dec 2015-13th Jan 2016. The Uttarakhand and H.P. regions along with the Northern plains are also very dry with very little precipitation. Some hill stations and regions in Uttarakhand have not even received the first snowfall yet. Precipitation anomaly ( % of normal Rains) from 13th December 2015- 13th Jan 2016. None experts like would like to understand the reasons for this explained on the blog. A strong El Niño persists, but ocean temperatures in the tropical Pacific are showing a gradual cooling signal. Climate models suggest El Niño will decay over the coming months, with a likely return to neutral conditions in the second quarter of 2016. The eastern tropical Pacific sub-surface has cooled by up to 3 degrees since late November. Weekly sea surface temperatures likewise show a cooling trend, evident since late November. However, recent tropical cyclone activity in the central tropical Pacific has produced strong westerly winds along the equator which may temporarily slow the decline of El Niño. Such short-term re-intensification of El Niño has happened before. 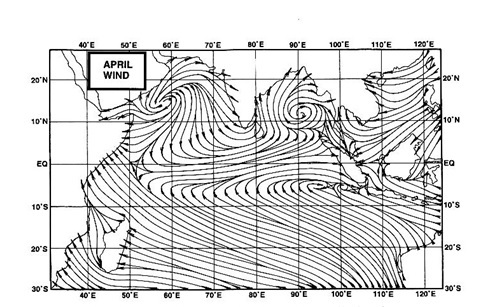 For example, 1997–98 saw a re-strengthening of El Niño conditions in early 1998, before the event eventually decayed. Based on the 26 El Niño events since 1900, around 50% have been followed by a neutral year, and 40% have been followed by La Niña. Models also suggest neutral and La Niña states are about equally likely for the second half of 2016, with a repeat El Niño the least likely outcome. Historically, the breakdown of strong El Niño events brings above average rainfall to parts of Australia in the first half of the year. The Indian Ocean Dipole has little influence on Australian climate between December and April. However, Indian Ocean sea surface temperatures remain at record warm levels across the majority of the basin. This basin-wide warmth may provide extra moisture for rain systems across Australia.